A glimpse of my short stay in the Japanese capital city and its most popular running route. For years Japan to me was only a transit to the US when I was returning to and from university break. Only very recently did I have a chance to properly see a little bit of the country beyond Narita Airport. When it was confirmed that I was going to spend Christmas break in Tokyo, I developed a secondary agenda and did what any runner with a vacation plan would: find out where the most popular running route in the city was. It turned out to be the perimeter of Imperial Palace grounds, a loop spanning 5km following the moat line. Nike+’s heat map shows it as a hot red zone, denoting how popular the route is, based on how many runners frequently check-in their runs via the mobile app there. It’s not officially a jogger’s path, however the locals have declared it otherwise, and you can see people pounding the pavement all year around. After 6 hours of flying from KL and landing at Haneda Airport, we took a bus to Shinjuku district where we were scheduled to stay. Originally we were supposed to stay nearer to the Chiyoda area and the Imperial Palace (about 3km away) but it was not meant to be. About 10 minutes before we reached the hotel, I saw a man (a runner that is) running on the sidewalk. It wasn’t the running that fascinated me so much as the time (it was close to midnight during winter where night temperatures average 2 degrees Celsius!). I shuddered with both awe and disbelief. The next day after we had caught up on sleep and made some sense of the spaghetti that is Tokyo’s train network map, we reached the Imperial Palace after walking 15 minutes from Tokyo Station. It was December 23rd, the birthday of His Imperial Majesty Akihito. This is one of two days in the year (the other being 2nd January) when the palace is open to the public, so it was nice that the start of my holiday coincided with this date. I missed the morning agenda where the emperor waves to the crowd from the palace balcony, so I headed out to enter the palace gardens and just walk around to sight see the area. But before that I took a moment to admire the two royal white swans that were swimming in the moat with their offspring and a couple of ducks, too. After bypassing the tight (but super polite and friendly) security guards, we followed the stream of people to the “greeting book” area, where we signed our names for his majesty’s birthday. Holiday-goers taking a stroll through the royal gardens. There were some runners too. After walking around and looking at the Gardens and remnants of the old fort, we exited the palace, only to be greeted with the sight of runners doing their thing. I really wanted to join them! But alas, I did not because I was not yet acclimatized to the cold weather and secondly because I was not dressed to run (I left my gear at the hotel). And thirdly because we had limited time to spend in the area. I took a few shots of the runners as mementos and trailed my eyes longingly as they wheezed me by. Runner at Imperial Palace, Tokyo. I like this photo as I caught him in mid-air! On my third and final day in Tokyo (Christmas day), I caught up with Rane “Jaf” Hafied, an IndoRunner and longtime friend who once interviewed me for a radio show back in 2006 to talk about my Indonesian pop culture website, myindo.com. I met him after spending 3 hours watching kabuki at the Shinbashi Enbujo Theatre in Ginza (which by the way I would recommend if you’re into theatre and classical live performances). Rane mentioned his friends were surprised to hear that we actually paid to watch Japanese opera. I guess it’s like foreigners telling us that they paid a bomb to watch a gamelan troupe play. Granted, seats were not cheap but we enjoyed it (with the help of English audio commentary unit which we rented), even if most of the audience were made up of senior Japanese citizens and foreigners (read: white people). After some hot drinks at the café near the theatre, Rane took us southwest-bound to his town residence of Meguro, about 4 train stations away. We then took a short bus trip and stopped just a few shops before Cabe, an Indonesian restaurant owned by a Japanese who once lived in Bandung. Since I had not eaten properly since arriving in Japan due to loss of appetite thanks to the cold weather, the spicy nasi goreng I ordered for dinner more than made my night. As we ate Rane talked about the scenic route around Tokyo since he started running 9 months ago. I just there sat listening in envy, secretly still wishing I could go for a run in the city and wishing it wasn’t so darn cold. What to do, my tropical blood runs deep. Rane & Fairy at Ginza, Tokyo. I am a big fan of Rane’s independent e-book, Lihat Ke Bawah. It was getting late and it was time to leave. We barely caught the last bus back to the train station to make our way back to our hotel in Shinjuku. We needed our rest as we would be travelling by air to Osaka the next day. Although I did not get to run in Tokyo, visiting the Imperial Palace and bumping into the Japanese runners, as well as meeting up an old friend who now shares my interest in running were “runcation” memories I will cherish. One thing’s for certain, I want to visit the city again! Nicely written. 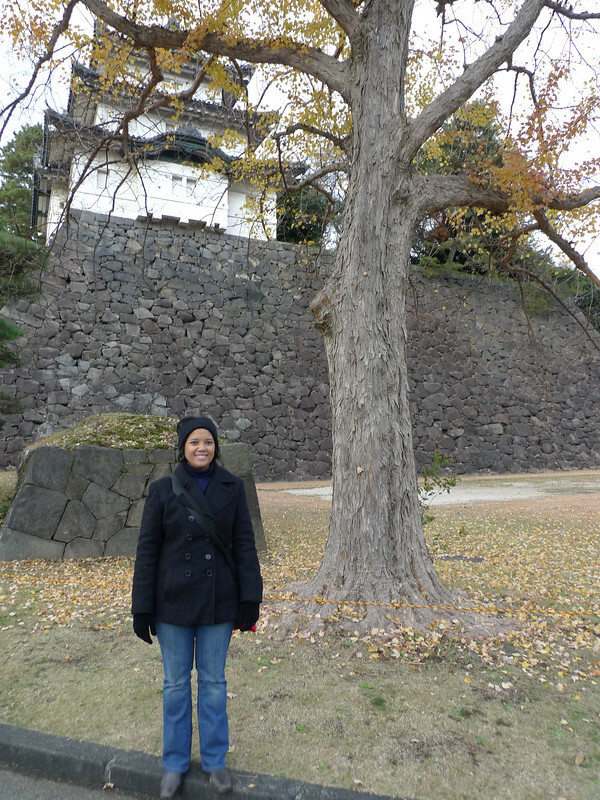 I just visited imperial palace yesterday. Hot summer. Fuhh.